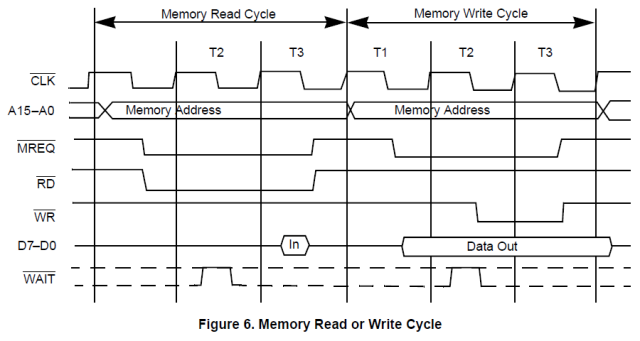 Teensy Z80 – Part 4 – VRAM explained, display modes, simple shell. This is the fourth part of a series of posts detailing steps required to get a simple Z80 based computer running, facilitated by a Teensy microcontroller. It’s a bit of fun, fuzing old and new hobbyist technologies. See Part 1, Part 2 and Part 3, if you’ve missed them. I mentioned ‘VRAM’ in the last post, which really was just an area of ram which I specified to the teensy through a port. I’ve now got something a bit more serious set up, which is completely separate from main RAM. It’s accessed via the I/O ports, after a flag has been set. 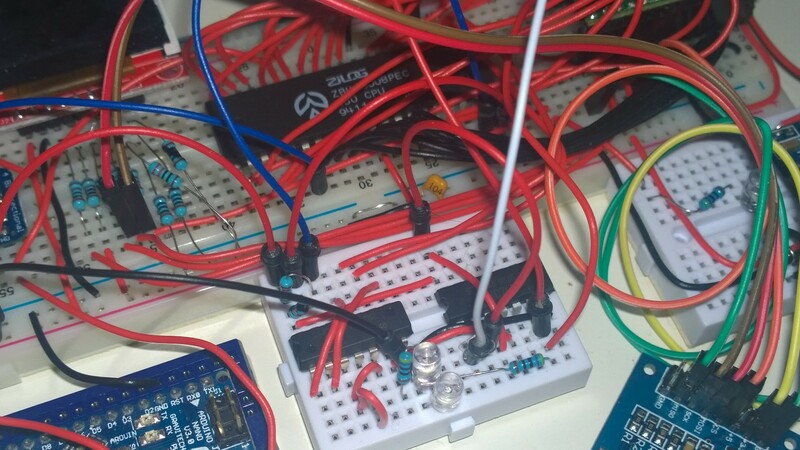 At the moment, I have all but one of the address bus pins connected on the z80. This means I can address 32KB of ram. 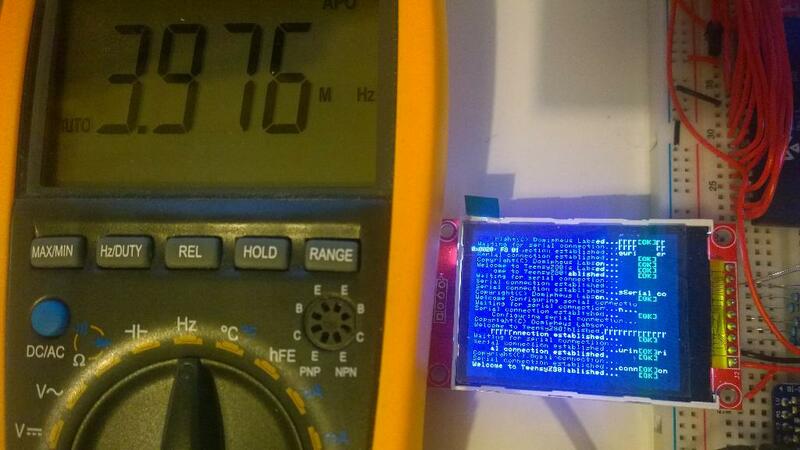 The screen which is connected to the Teensy via SPI is a 320×240, 16-bit colour unit. Sadly, this means a full size framebuffer for this screen would be an eye-watering 150KB! Even half this size at 160×120 full colour is 37KB. I cannot add the additional address bus pin for a 16-bit address space due to running out of I/Os on the Teensy. I have a single one left, and it’s needed for something I hope to explain in the next few posts. I can use a 256 colour palette, which brings the memory requirements for 160×120 down to 18KB, but it’s still a large chunk of memory which can no longer be used for programs. So I decided to use 16-bit (15 in my case) i/o addressing to enable a secondary 32KB address space – to use for VRAM. The Z80 in/out instruction in which the port is the C register actually places register B onto the top half of the address bus, allowing access to the full address space. We have a specific entry in the standard 256 port I/O space which is used to set a flag which the Teensy interprets as an instruction to treat all further I/O requests as writes into a special VRAM memory. I then have the highest port possible (0x7FFF) as the disable VRAM port. 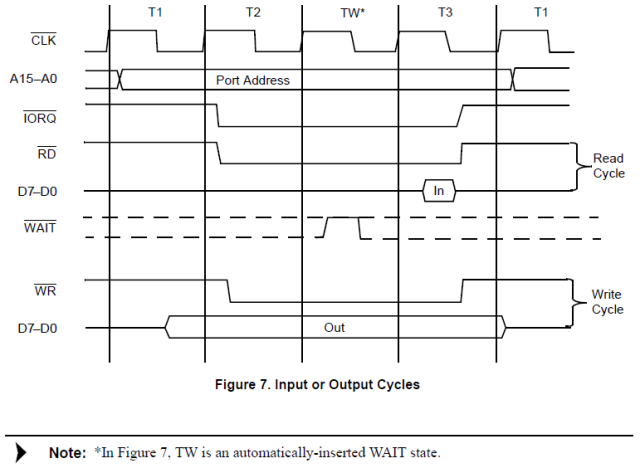 Reading from this port resets the Teensy and I/O operations return to their standard state. This allows a completely separate memory space for VRAM, which allows for all of main RAM to remain for programs and data. There is a downside to this – I/O writes have an additional wait cycle automatically inserted, so they are slower than normal RAM writes. Additionally, things such as loading images from SD cards into VRAM would need to go via RAM, unless additional flags are inserted into the file system requests to specify what memory spaces the buffers refer to. 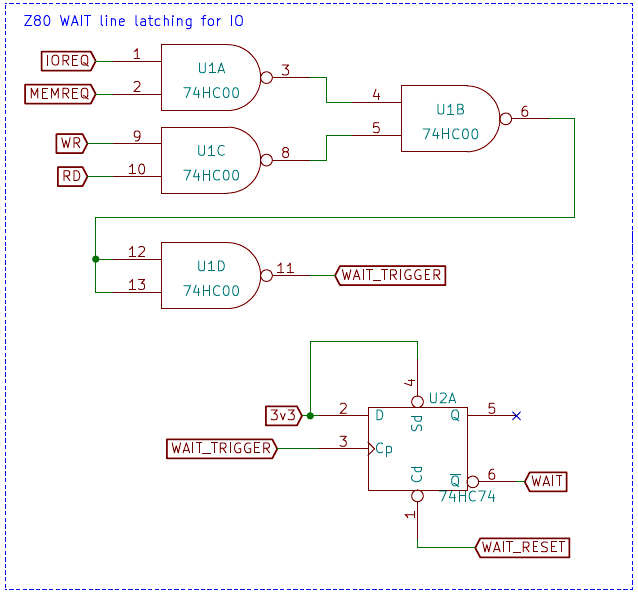 However, I do think that those downsides will be insignificant when I try to make the Z80 clock asynchronously with the Teensy operations, as there are likely to be many wait states for RAM as well as I/O operations forced by the use of the WAIT input to the Z80. On the Teensy, the code for this is very simple. We have a second global array to use as the VRAM storage, and then have a ioVramBankSet flag which we check on i/o operations. The above code is really all we need for this. The upside of using this I/O style system instead of say, RAM banking, is that the instruction stream and source data can remain in standard RAM and we do not need to do any mapping of the address space which would restrict us significantly with only 15 address bits. Now we need to make use of the data which is stored in that space for graphics! I mentioned earlier the amount of memory needed for various resolutions and colour depths. The simple fact is that the Teensy 3.1 microcontroller I’m using only has 64KB ram. Within that, we need the Z80 RAM, VRAM, and then working memory for the teensy itself – for driving the display, and working with the SD card and handling the FAT filesystem. This pretty much means 160×120 8bpp is really the maximum we can achieve. When combined with a 256 entry palette, we can get a very generous range of colours, and come in at less than 20KB. So we’ll have the VRAM set to 20KB. The mode is set by an index value which is written to an IO port. A draw port exists, and a write to it initiates a full screen redraw. The data bus value is ignored. I may implement a sub-screen redraw which acts on a set area of the screen later as an optimization. 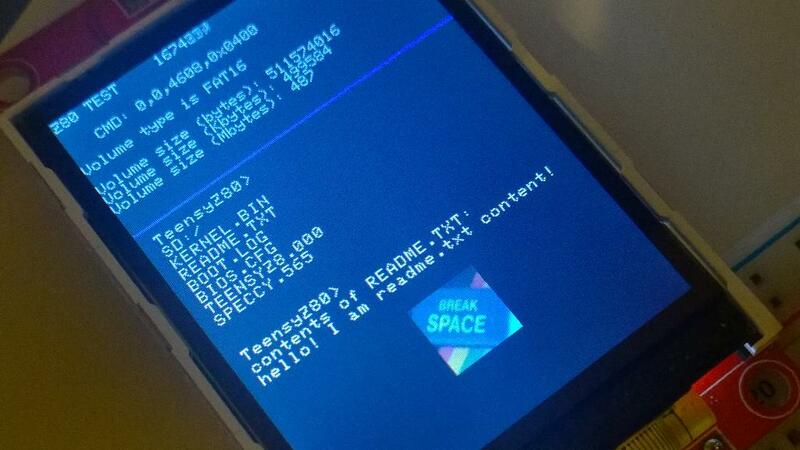 An additional feature is that the palette has an offset associated with it, which wraps the 256 bytes. So, to implement the palette-shifting effects of plasma, etc, it’s an incredibly easy hack. It also means that when I implement modes with smaller bits per pixel indices, there can be multiple palettes stored that can be switched with a single i/o write. That is the trick used in the plasma example shown in the middle of this video. The Z80 is running slow at around 2KHz (remember, everything is still synchronous). The code is very simple to load pixel data into the VRAM space from RAM, and to do plasma palette cycling. This will load the pixel and palette data which are stored in the binary already, into VRAM. The PORT_VRAM_PALETTE_IDX I/O port sets the ‘palette offset’ so it can be rotated incredibly easily, and PORT_VRAM_DRAW draws the contents of VRAM to the display given the current display mode set via the PORT_VRAM_SETMODE port. The ram_2_vram function shows how the VRAM memory space is enabled with the PORT_VRAM_BANK_SET port, and disabled with a PORT_VRAM_BANK_RESET read. Also note how I disable interrupts within this function – as interrupts may use i/o ports themselves, for instance the serial receive ‘data available’ interrupt, it’s important to disable interrupts whenever the VRAM is enabled for writing. Other than that, it works a treat! These video modes also allow for some fun error screens. 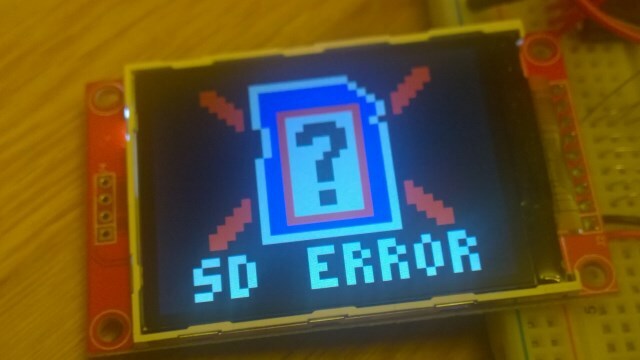 For example, if the SD card is not mounted correctly (and, on boot the teensy tries to locate a kernel.bin on the SD, so it needs to be there) we get a nice error graphic. This one uses the 40x30x16bpp mode, but I’ll make it a lot smaller soon with a 16-colour palette mode. You can also see from the video above that I have a very basic shell working, it simply takes input characters from serial and runs programs matching those names from SD. It does no argument passing, all it checks is if a file exists with that name, and if it does, loads it into offset 0x1000 of memory, before calling into it. The ls, cls and plasma binaries are all simply made in Z80 assembly and have no dependencies on any features that a kernel may need to provide. At the moment, I do have the sdcc C compiler running with a compiled ‘kernel’ which allows for some real operating system services and true program loading with arguments to main, system calls, etc. Watch this space! I’ll talk more about that soon 🙂 Code as always is on my github. A full schematic is incoming, but it’s not difficult to decipher if you want to make your own. I hope you’ve been enjoying this Teensy Z80 project. If you have, let me know on twitter @domipheus! Part 5 is now available! 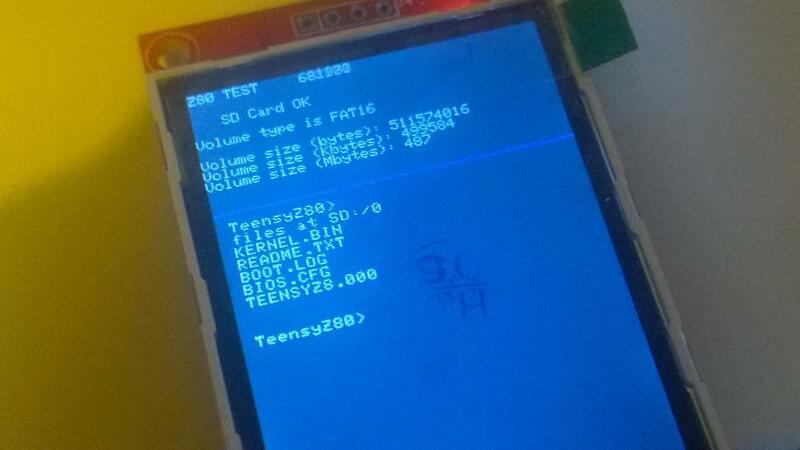 Teensy Z80 – Part 3 – File System, SD Card, VRAM? 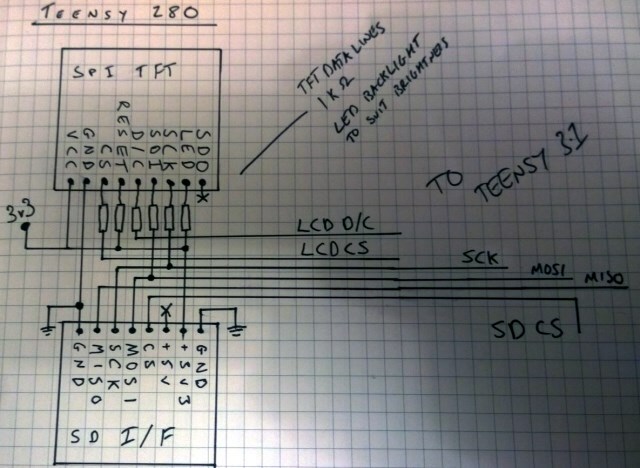 This is the third part of a series of posts detailing steps required to get a simple Z80 based computer running, facilitated by a Teensy microcontroller. It’s a bit of fun, fuzing old and new hobbyist technologies. See Part 1 and Part 2, if you’ve missed them. 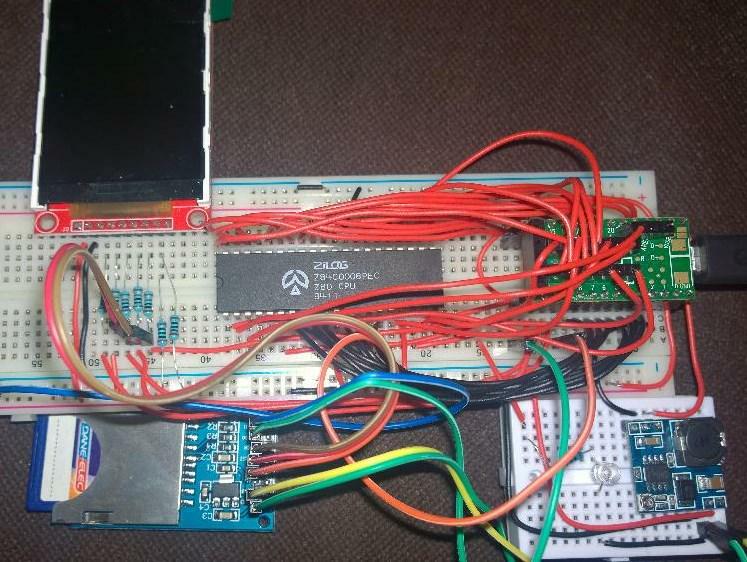 Now we have the base Z80 working, interrupts and a display connected which can be manipulated in a console/terminal fashion using the Z80 I/O ports. The next step? File storage! The obvious choice for file storage here is an SD card. It uses ~3v3 logic, which is what we are running everything with, and also uses the SPI bus, which we already have set up for our LCD screen. We’d need another pin on the Teensy for the SD chip select, and also another for the MISO line reading data from the SD – the LCD only ever used MOSI for input. Now, as I keep stressing, this is just a little fun exercise. So to make things (a lot) easier, the Teensy will actually handle all of the FAT file system behind the scenes work. I’m sure I could get it all ported, or find a Z80 FAT16 implementation already, but I like the pace this project is moving at – so we will cheat more! I won’t go into too much detail on the Teensy side of things. The code is all available on my github project page if you want to look. I Teensy code uses SdFat, which means I need to license the Teensy Z80 code as GPL (for those who don’t know, my stance on GPL is “ugh“, but will abide by its demands). For open, we provide the name and flags in the structure before initiating the open command. Flags are whether we are opening for reading, writing, appending, etc. The open command itself will write the error, size and type fields. Error and size are self explanatory, the type field is for extra information, such as if this file is actually a directory. ; - operation is immediate. I’ve left out the previous step to this, which is actually opening (and closing) the root directory. It’s implemented as a special case of open where “/” is the filename. But you can see the code is very straightforward. We can now use the information written at filesys_readme_open_read to help read the file contents. The file size is written to the 4 bytes after the error byte, so we cam read that in as to see how much memory we need to read the whole file into memory. It we read the first byte, as the system is little-endian we will read the file size if the file is less than 256 bytes. We’ll assume README.TXT is (well, we know it is) and so for simplicity will just read this once. The file_offset is where you’d typically seek() to before a read. The block size is the size of the read/write request, and the mem_buffer_ptr should point to a further area of memory that is at least of size block_size for the file system to write into (or read from given a write instruction). After opening the file, we can insert the size of the file into the block_size_lo part of the data, to read the whole file starting from offset 0. Now we use the same style of port i/o to provide the read/write port with the location of this structure in memory, and fire off the EXEC command to perform the operation. This setup allows for quite a decent amount of functionality. I can read files much larger than the available RAM (16KB as I write this) due to providing the seek location in the file as a file_offset in the read command. Writing acts exactly the same, except that scratch_mem would contain what I wanted to write to the file, and the file would be opened for writing, and the command op_type set CMD_WRITE. I skipped the fact that before opening README.TXT I had to open the root directory. In this system, directories are simply files. You need to be in the correct working directory to open a file, the directory does not form part of the open request. In this way, internally a directory tree can be kept on the Teensy. I’ve not implemented this fully yet, as for now, a flat filesystem really is enough for me. The NEXT command allows the discovery of files in a directory, like most other file systems. Unlike the other file operations, this operation has no arguments, and simply operates on the current open file – if it’s a directory! For this request, since this operation only writes memory, we can use the scratch_mem location from earlier, and initiate the GETNEXT command. We initiate GETNEXT operations until the error byte becomes non-zero. jr nz, nomorefiles            ; non-zero error? no more files. That really is all there is to it! At present, only one file can be open at any one time. This is quite limiting, but for now, it will do. I can always add some sort of file descriptor system later. The filesystem test I wrote lists the root directory, reads README.TXT, writes ‘0123456’ to TEST.TXT, and then reads a file speccy.565. Speccy.565 is an image file! This was done fairly quickly, for some visual eye candy. speccy.565 is a tiny 48, 16-bit colour image of a ZX Spectrum keyboard. It’s in the 565 format, in that there are 5 bits for red, 6 bits for green, and 5 bits for blue. The file has no header, and the teensy is currently hard coded to have a 48x48x16bit ‘vram’. All I have working at the moment is a port for setting the start of this vram in memory, aligned to 256 bytes so we only need to set the top 8 bits of the address. I also have a port which ignores what is on the dataBus, it just initiates a draw of the vram to the LCD screen. It’s pretty primitive just now, but I hope to add more display and colour modes – as at the moment this 64×64 image in vram takes up a whopping 25% of the total RAM available to me! That’s it for this post. We have a decent amount of filesystem functionality available, and I’ll be using that significantly in the future posts! I hope you’ve been enjoying this Teensy Z80 project. If you have, let me know on twitter @domipheus! Part 4 is now available!